We create award-winning designs for model homes, multifamily developments, clubhouses, sales & leasing offices, design centers, and amenity areas that help properties sell. Successful interior design and merchandising is about highlighting great architectural elements and emphasizing livability. It’s about having your property standout from the rest, evoking a positive feeling with potential residents, and creating a deep desire to live there. That is what Lita Dirks & Co. has been doing successfully for more than 20 years. Although we have earned numerous awards and accolades, our biggest reward is helping our clients make sales that enhance their bottom line. Elise Platt, E.A. Platt & Co.
Adrienne Albert, The Marketing Directors, Inc.
Our goal is to help make a home builder and/or developer’s job easy and successful. To do so, we have refined a detailed process that ensures we deliver impactful designs on budget, on time, every time. Contact us today to learn more about our exclusive D3 Difference and all the value-added free services we provide to help our clients succeed. The Lita Dirks & Co. team has garnered respect, praise, and numerous awards for unsurpassed attention to client needs and remarkable interior design that sells homes. We invite you to get to know us a bit better. At what point in the building process should I contact an interior designer? The earlier the better! Since this is a collaboration, we ideally like to begin working with our clients in the dream and development stage when branding is being developed and before floor plans are finalized. At this point, you can take advantage of our complimentary floor plan critique service where we may have recommendations that will enhance your plan’s livability and furniture layout. At a very minimum, 13 weeks are needed to develop design, order, ship and install. First of all, we gather as much information as we can from you about your project – such as vision, goals, challenges, potential residents, budget and timing requirements. After we receive your CAD plans, we prepare a proposal, contract and preliminary project timeline outlining all steps involved in the design and merchandising process from start to finish. Once under contract, the real fun begins! We’ll conduct additional research and send you a merchandising questionnaire to complete. From there, we’ll complete the buyer profile. Based on all this information, we then develop the design concept, colors, fabric selections and furniture options to present. What can I expect to see at your design presentation? We understand that it can be difficult to visualize design. Therefore, we’ll provide you with as many details as possible so you can get a good picture of what the finished product will look like. Specifically, you’ll see an overall design concept, colors and fabrics for each space, as well as multiple floorplan options and furniture selections. In addition, we elevate (or draw) all areas where we’ve added design elements, such as wall and ceiling details, so you’ll have a clear idea of what we’re proposing. One more thing. Usually, directly after the presentation, we’ll work with you to select all interior specifications like cabinetry, flooring, countertops, hardware, etc. We’ll then provide a detailed specification sheet so it is clear as to what exact selections were made. Lots! You know your project best. We are here to make sure your vision is realized and that the finished product creates visual excitement and stimulates sales! We’ll introduce you up front to the experienced and talented team members you’ll be working closely with throughout the design process. Because of our team-based approach, there will always be someone available for you to communicate with that is knowledgeable about your project. How do you work from a distance? Very efficiently! And, with today’s technology, it’s easy. Over the years, we’ve developed extremely effective processes and systems that ensure our projects are always seamlessly completed on time and in budget. In fact, over the past 20 years, we’ve completed hundreds of highly successful long-distance design projects. What’s involved with your design installation? We’ll, of course, keep you updated throughout the process and about three weeks out from the installation date, we’ll send you an installation confirmation form to make sure the site is ready and there is no confusion about when we’ll arrive and what is needed. We send all furnishings, rugs, art, etc. to a warehouse near the site and coordinate with them on delivery of all items. Our designers will meet the trucks on site and oversee every detail. Depending on the project, it takes two to five days to move everything in and install it precisely. On the last day of the install, we’ll all complete a final walk through to make sure everything is to your complete satisfaction. Before leaving, we’ll finish up any final requests. If we need to order something additional, we’ll coordinate everything and keep you updated. At the end, you’ll receive an inventory list and photos. Then – we can all celebrate a spectacular job! Why should I hire you over another design firm? Good question! All design firms will tell you they’re experienced, professional and service-oriented. However, we take it a few steps further. Our exclusive D3 Program offers you additional services FOR FREE. You’ll see those services outlined on this page. Oh – and one more thing. We take our work VERY seriously in order to make sure our collaboration is a success. However, that doesn’t mean this process shouldn’t be enjoyable. It’s our job to make it as easy and fun as possible for everyone involved! Just ask some of our past and current clients. 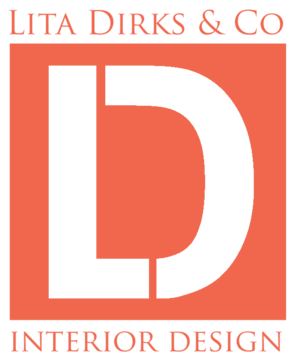 contact Lita Dirks & Co. for all your interior design and merchandising needs. We’d love to work together.